We have come to the end of another year. Today is the last "Be Inspired" for 2011. I have chosen to share Acts 7. It the entire chapter, take a few moments to read. I pray for this New Year that is upon us that the Lord would give us plenty of opportunities to share the Gospel of Jesus Christ; that we would not shrink back for time is short. People slip away every day, including our family members and friends. Even if the crowd closes their ears and refuse to listen to the truth, their might always be one that God will use, one that will respond, be transformed and sent out; Saul was changed to the Apostle Paul. The Lord has a way of reaching men and knocking them of their "high horse" and getting their attention. He did it to me and saved my soul. Let's share the greatest news ever! There is still time to invite someone to church and begin the New Year in the courts of the Lord. In all the pain and joy of 2011 the Lord continues to mold me and even you. Nothing escapes him, he sees it all. Let's hold on, for life goes by quickly; we want to be found standing/bowing in the presence of God, having our ears hear, well done good and faithful servant. Interesting that the crowd covered their ears after Stephen had shared his testimony and told them the truth that had led them to that point. They heard it but did not receive it. They chose death over life. One of the definitions I found reads…To look forward to with confidence or expectation. Look down at your hands….. If they are clenched….Unclench them….. Slowly Stretch them out before you…..
We will climb, slow as it may be and grab a hold of Hope. Hope is something we look to; it seems it lives in the future. We are not quite there but are striving to arrive. Hope is like a dream that is in the distance; seems attainable but I haven’t reached my destination. The Hope I share with you today is found in the Lord. But God desires abundant life for us. with a tangible grasp of the future. What is does indicate is we have chosen, not to be a prisoner of the horrific tragedy that has affected us and forever linked us together. It signifies that the anguish, the real pain we feel will not keep our joy suppressed; a victim curled up in a corner of despair and unfruitfulness. 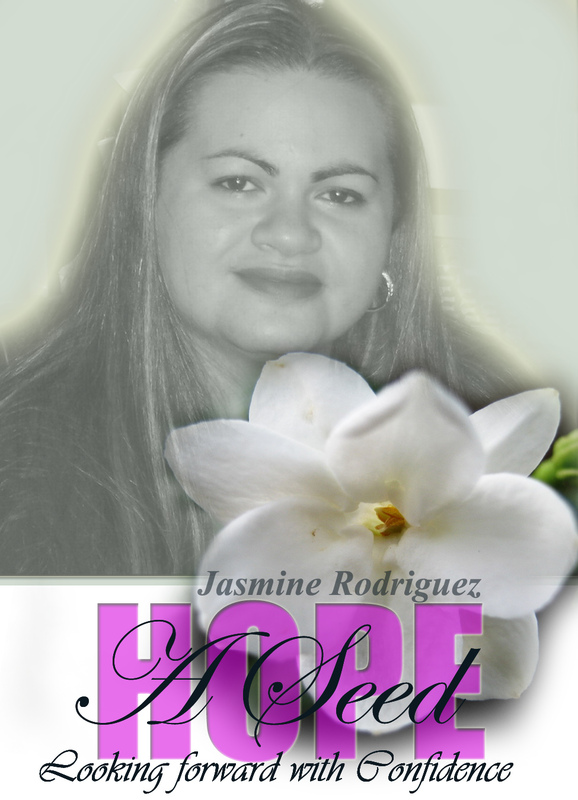 Co-worker, and beloved daughter, it encourages us to proactively remember Jasmine Rodriguez and continue to make her life count! Through their hurt and brokenness they allow a breath of hope to lift them beyond the throbbing pain and live again. You see, Hope is not just an action or a feeling, though in saying so we are correct. But for me Hope is the person of Jesus Christ that has given me life; life abundantly and the confidence to share it with you today. It once thrived and the beautiful smelling aroma of life was noticeable from afar. This seed brought joy to others. How incredible that in God’s design the seed though it seems dead still has the ability to produce life. a life that affected us all and left an imprint in our hearts forever; this life that was snatched from us can become a seed for us to plant, a seed of hope for us to water and wait to see its fruit. it’s a seed for the sake of the prisoner who has yet to escape. It’s a seed of Hope for us who live. Jasmine Rodriguez to those that have yet to be free. We chose to be free, no longer a prisoner ourselves of hopelessness. Though sorrow has been a companion, we now swap partners like in a beautiful dance and choose Hope to guide our future days to come. And that my soul knows very well"
Today I want to begin with a small exercise…. Hope promises a better tomorrow. My name is Elizabeth Rodrigues and I am Jasmine’s Aunt. I have found that Hope has never disappointed me. For some Hope can be a feeling, and in saying that we are correct. My hope is in Jesus Christ who has saved my soul, given me purpose and joy in this life. Today I want you to understand that I don’t come with a quick fix for the pain we share. I’ve come to impart a glimmer of hope to get us to tomorrow. We have had a lot of mornings since that horrific day that changed our lives; the day that brought pain and a stinging ache to our hearts. We have emotions that can cause us to laugh and emotions that can feel the tragic pain of loss. It’s ok to live…..Liz it’s ok to live and laugh again. The enemy of our soul desires that we would stay confused, unfocused, troubled, and perhaps to have remnants of guilt consume us. What could we have done differently, did we miss a warning. Could we have avoided this? We can stay in this ring for a while, fighting imaginations and thoughts that at times that are deceptive. Death is a real separation that can leave us empty for a time. You see, the thief comes only to steal and kill and destroy; But God says, I have come that they may have life, and have it to the full. We can’t have sorrow and despair walk with us as if they are our companions through this life. Grieving and mourning they serve their purpose; it’s how we are designed. I know this full well as I have not only lost my niece, but only 4 months before, my mom too was gone in a blink of an eye, therefore now I too must embrace tomorrow with Hope. We hope because there is a future. Today’s ceremony is an indication of us moving forward. Moving forward does not mean we have forgotten. Living life now requires a new weapon, a fortified agent to carry us through our tomorrows. That, weapon, that negotiator is Hope. Hope will not disappoint us. Hope is the key that opens the prison door so that we are no longer the prisoner. Hope can and will prod us to resist the shadow of depression and hopelessness. Do it for yourself, for the sake of my niece, cousin, co-worker and friend. Friends and family, today that is us. The Bible is the resource that has pointed me to the Hope I speak of today. We are going to take hold of our sadness and brokenness and for the sake of Jasmine, for the sake of others who are still in need of help, we are going to plant a seed of hope today. A seed is the part of the vegetation by definition that has died. We did not choose the death that occurred. For our own healing process, we will choose HOPE. There is Hope for us and hope for the future. We have the ability, but most importantly we must choose to let go of the pain that wants to create scars that will immobilize us. We live because we must, lest we too perish in the land of hopelessness. Father in heaven, Lord Jesus; help us release the pain. A seed, though it seems dead; once planted, watered and nurtured can bring new life. Jasmine’s life memorable…making it count! “wild flower” that we did not necessary come with the original purchase, but when they bloom, somehow they add to the beauty and array of the landscape. Along with hope today, I pray that in your heart joy, peace, patience, kindness, goodness, and of course the greatest of all Love would sprout forth. A sweet aroma to fill our hearts again….. Honestly, often I am blinded with pride and I can't even see my own flaws. Oh Lord I don't want to be a hypocrite. Lord I know I can't pretend to you. Your Word reflects who we really are. We come to you who is able to wash us clean, refresh and renew us. Your Word says that you oppose the proud but give grace to the humble (James 4:6) Help us oh Lord to recognize when we sin so that we may come to you quickly! Lord, we know if we confess our sins, we know that you are faithful and just to purify us from all unrighteousness (1 John 1:9). It's a new day! Because of the Lord's great love we are not consumed, for his compassion never fails. They are new every morning; great is your faithfulness (Lamentations 3:22-23). Lord we will examine my own hearts. for forgiveness of sins. But I say to you, I will not drink of this fruit of the vine from now on until that day when I drink it new with you in My Father’s kingdom.” After singing a hymn, they went out to the Mount of Olives. In this fast pace world people are used to everything quick. A short message of encouragement is good, its like a vitamin; it brings nourishment where we lack. But, rest assure we must sit down and eat; eat a good meal ( a long message; profound; causing us to think deep on the Word of God); a meal where you must get your hands dirty to get to the inside of that chicken piece even as you savor every bit (lol). Meals are meant for us to sit down with the Master, our Lord, and stay there a while. "vitamin". I'll take them both! On the third day Esther put on her royal robes and stood in the inner court of the palace, in front of the king’s hall. The king was sitting on his royal throne in the hall, facing the entrance. When he saw Queen Esther standing in the court, he was pleased with her and held out to her the gold scepter that was in his hand. So Esther approached and touched the tip of the scepter. There is a garment of Righteousness that we wear, those who have bowed the knee and in repentance have called on the One who alone can save us from our sins. Fear had come into their hearts. We find them hiding behind a bush; “I heard you in the garden, and I was afraid because I was naked; so I hid.” Genesis 3:10 Blood was shed. 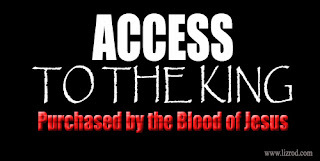 Jesus has paid a price with his very own blood and has obtain eternal redemption for us (Hebrews 9:12). Jesus has made a way for us to commune with the Father again. The results of the cross, the way made for us, the sacrifice of the Son who obeyed even unto death (Philippians 2:8 ). A covering, a robe of Righteousness given to use and designed and paid for by Jesus! From the beginning of time God has been clothing us if you will. So go ahead, dressed in the garment he gave you, enter his courts, and find mercy & grace. It's because of the Son that we can enter. Fall on you knees in reverence, fall on your knees and worship Him. Make your request known to him who sits on the Throne. Pour out your heart to him. He is not taken by surprise. Esther 5, says that the king was sitting in his royal throne facing the entrance and there his eye catches a glimpse of Esther. I can imagine Jesus sitting on His Throne waiting to see who will enter his courts. He's paved the way and paid for the access he had given us. It's by his blood. So go ahead and enter into the Palace of the King! Like Esther, approach and touch the scepter extended to you. You have captured not only his eye but his heart!